Japan GDP data, inflation figures from the UK and the US, Employment data from the UK the US, New Zealand and Australia, US FOMC Meeting Minutes release and Manufacturing Index. These are the highlights on forex calendar. Japan GDP data: Sun, 23:50. GDP growth in the second quarter is expected to be 0.2%. UK inflation data: Tuesday, 8:30. UK CPI forecast for July is expected to be 0.5%. Eurozone German ZEW Economic Sentiment: Tuesday, 9:00. German investor moral is expected to reach 2.1 in July. US Building Permits: Tuesday, 12:30. The number of permits os expected to rise to 1.16 million-unit pace. US CPI: Tuesday, 12:30. US inflation is expected to remain flat in July. NZ Employment data: Tuesday, 22:45. New Zealand’s job market is expected a gain of 0.6% in the second quarter while the unemployment rate is forecasted to decline to 5.3%. UK Employment data: Wednesday, 8:30. The number of unemployed is expected to grow by 5,200 this time. US FOMC Meeting Minutes: Wednesday, 18:00. June’s FOMC focused on May’s poor employment report showing a small job gain of 38,000. This disappointing reading diminished any serious chance for a foreseeable rate hike. However, policymakers noted that future rate hikes will depend on improvements in the labor market as well as the Brexit vote consequences are handled. The members decided to wait for additional data before voting to raise rates. Australia employment data: Thursday, 1:30. The labor market is expected to expand by 10,200 jobs and the unemployment is expected to remain at 5.8%. US Philly Fed Manufacturing Index: Thursday, 12:30. August’s manufacturing index is expected to reach 1.4 points. US Unemployment claims: Thursday, 12:30. The number of new claims is expected to be 269,000 this week. Daily price broke one of the 'reversal' Senkou Span line of Ichimoku indicator together with trendline to above: the price broke this line to be located inside Ichimoku cloud in the bearish ranging area of the chart waiting for the direction. Absolute Strength indicator is estimating the trend to be on ranging waiting for breakout/breakdown, and Trend Strength inticator is evaluating the future possible trend as the possible daily bullish reversal. 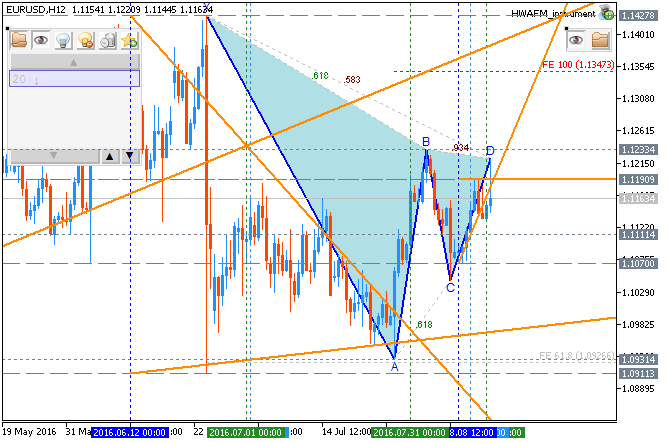 If D1 price breaks 1.1045 support level on close bar together with descending triangle pattern to below so the primary bearish trend will be resumed. 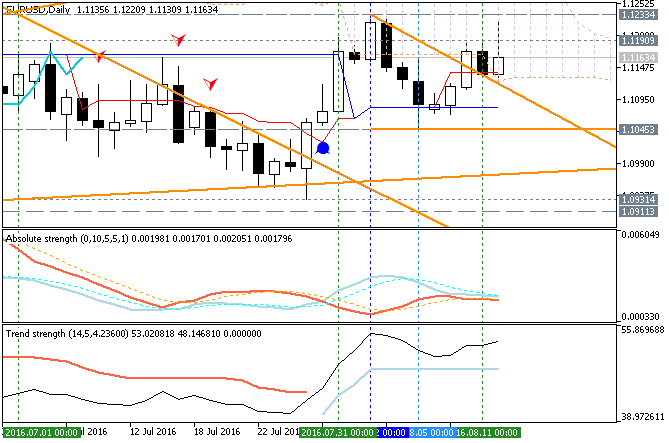 If D1 price breaks 1.1233 resistance level on close bar from below to above so the bullish reversal will be started.